Recently, I've been putting more effort into my classes because I found out that the more effort I put into them, the more enjoyable they are. And it makes sense, the powerpoints that the school provides are often boring. Adding my own spice to the class makes it more interesting for all parties. This step is part of a process that I'm undergoing to make my job more meaningful. For example, much of the extra content that I add to the class has to do with protecting the environment. Other content touch upon creativity, education, activism and sometimes a little philosophy. I also proposed that we start recycling paper in the last teacher's meeting. Luckily, I didn't encounter any opposition (nor should I have) and so now, we have a recycling box in the teacher's room. I'm going to propose other ideas that I think will make the school more green, and hopefully, I will be convincing. I think it's productive for me to start thinking about how to make my workplace green. Helping companies go green is a very possible candidate for a future career. Fortunately, the major I want to study is exactly right up that alley. Here is a logo I made for the school. They had to name it “le Elite” because “Elite” was already a registered name. I had a lot of trouble trying to make the “le” fit in and I'm still not happy about it. And yes, the green is symbolic. 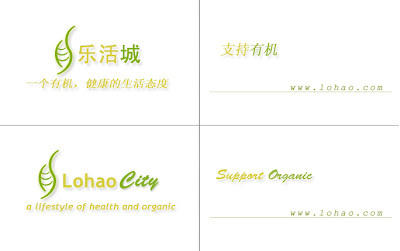 This is a business card I made for Lohao City which is an organic supermarket in China. They currently have about 6 stores in Beijing. Chinese people are starting to worry more about their health and therefore, are starting to demand organic food. Lohao City was founded to respond to this rising demand. Most of its products are imported, but they do have their own organic farms so the produce isn't too expensive. 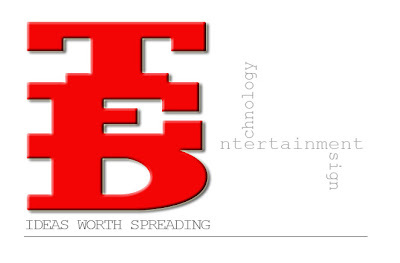 This is a graphic I made today by using the official TED graphic as a base. TED talks is a series of presentations given by people in the fields of technology, entertainment and design. They present to us, I believe, a more accurate picture of the true form of intelligence by showing its diversity. There was one talk given by Sir Ken Robinson about education and in this talk he mentioned how intelligence is diverse, but the public education system only wants certain forms of intelligence. “It has mined our minds, in the way we strip mine the earth for a particular commodity” as he put it. By doing this, the system prevents the development of the potential of the human mind. I believe I'm a victim of this educational structure. I feel as if my intelligence is extremely narrow. What TED presents to us is the diversity of the human mind. It reminds us how intelligence, creativity and play are all interlinked. But most importantly, it reminds us what we are capable of. It gives me hope that I can one day reclaim and mold my potential into anything I want.